You would think that asking a self-professed chocoholic to bake a cake with chocolate would be her dream come true. She'd run to the kitchen with a million ideas and have difficulty deciding on which of her many ideas would be the one. Perhaps she'd bake a few and then decide. Yeah...it did not quite go like that for me. I was stumped. I was actually mulling over a mocha cake when it hit me that I should just keep it plain coffee/espresso and work my chocolate into a glaze (uh oh!). Luckily, I thought of using my favourite buttercream before I went to glaze-land. I LOVE LOVE LOVE flour-based buttercreams. They are light and fluffy and not as sweet as American buttercream. When I am deciding on buttercreams, it's usually Italian Meringue, flour or Swiss Meringue - in that order. This flour buttercream different from others - by accident. I was ready to make it when I realised that I was out of milk. I started getting ready to go get milk when I thought - well, why not try it with plain water? And you know what? It worked! I honestly could not tell the difference. It was the same light and fluffy buttercream that I loved. I can't wait to try this with other liquids - juice, perhaps? I hope you try this and love it as much as I did. And if this doesn't suit your fancy, perhaps one of the other "chocolate" bundts made by one of the other Bundt Bakers might? This month's host was Veronica (thanks, Veronica!). Be sure to check out her bundt and the others below. We take turns hosting each month and choosing the theme/ingredient. If you are a food blogger and would like to join us, just send an email to Stacy at foodlustpeoplelove@gmail.com or ask to join our private Facebook group. Combine flour, sugar, salt, baking powder and baking soda in a large bowl. Bring the cup of water to a boil and stir in espresso powder, butter and oil. Stir until butter is melted then immediately pour over flour mixture. Stir for a minute just to let it cool somewhat. In a small bowl whisk eggs, sour cream, milk and vanilla extract. Pour over flour mixture and mix until thoroughly combined. 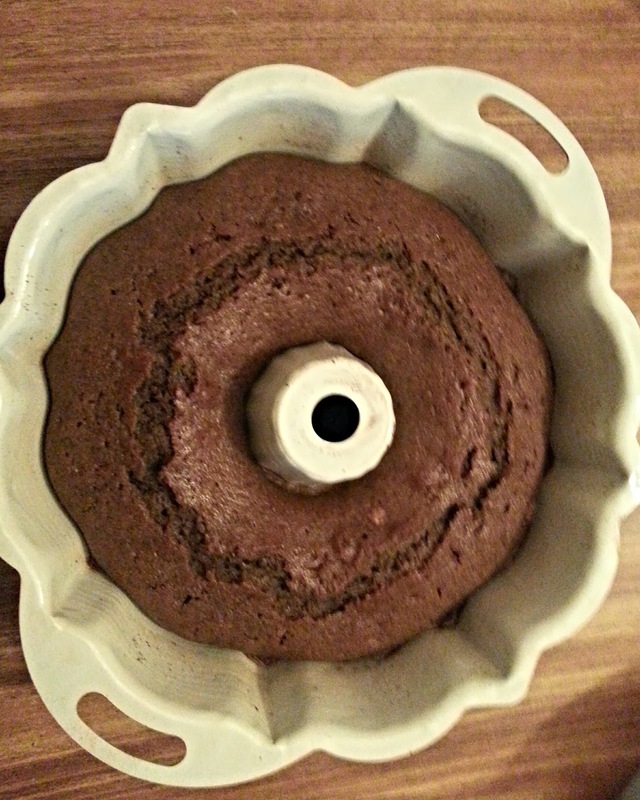 Pour mixture into prepared bundt and immediately place in oven. 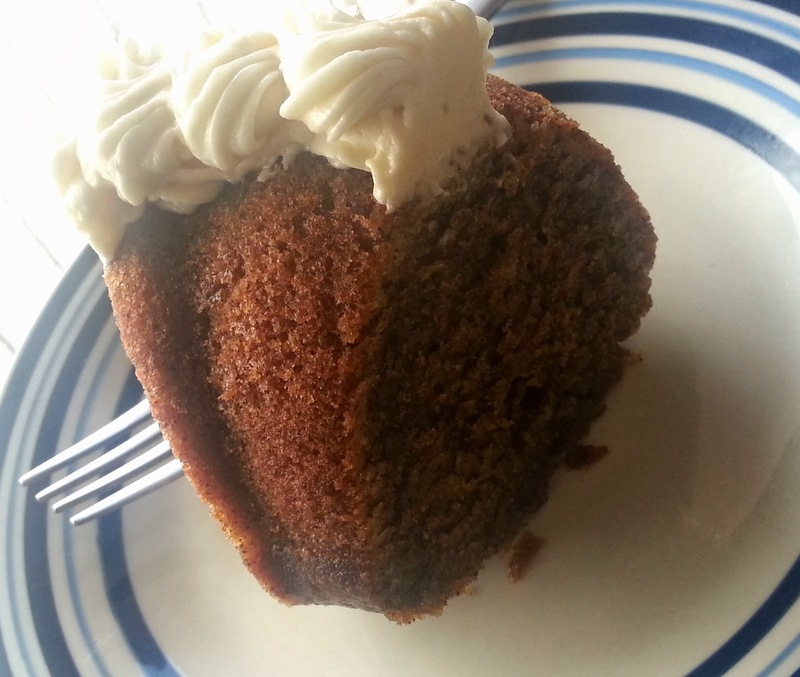 Bake for 40-50 minutes or until a toothpick inserted into the center of the cake comes out clean. Cool completely before frosting. In a small saucepan, whisk together water, sugar and flour over medium low heat. Whisk continuously until mixture thickens and reaches the consistency of a thick pudding. This will take a few minutes. Remove from heat, cover with plastic wrap and allow to completely cool. You can place this in the fridge to speed up the cooling. When the flour mixture has cooled, using a whisk attachment, whip the butter until it’s light and fluffy then add the flour mixture. Whip on medium speed until the mixture is thoroughly combined and resembles whipped cream. Add melted chocolate and vanilla and whisk until combined. Ground espresso or instant coffee crystals can be substituted for espresso powder. If frosting is too soft, refrigerate for a few minutes. Milk can be used instead of water in the frosting. Thanks! I'd try for March's Bundt Bakers but I already have another idea. But it's going to happen! I am totally like your friends, so I understand. And as a result I end up baking with white chocolate a lot also. I think this combo sounds amazing! I'm not even sure how they feel about white chocolate. I refuse to ask. Ha. I know some don't particularly like dark chocolate. Too picky for my needs. Nice cake and I am very intrigued by your frosting. I have to make it just to see how it is. I like the idea of it being not as sweet (very European). I'm not a fan of overly sweet icing, so I can't wait to try your version! 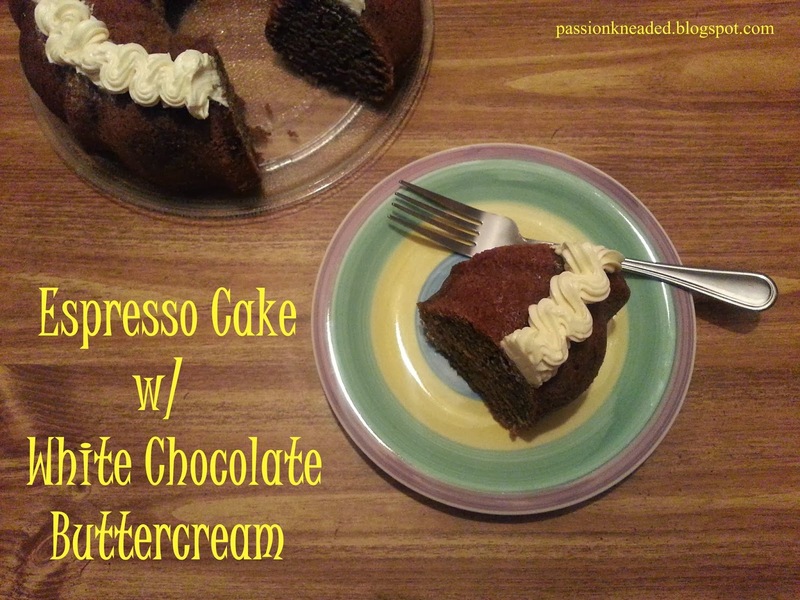 Espresso Cake sounds delicious. Thanks! Sometimes it doesn't always work but I'm always excited when it does. Wow Iove anything with espersso! I cant wait to try this one. I am a big coffee fan, so I just know I would love this cake. This is definitely for a coffee fan. I thought of adding coffee to the buttercream but I wanted it to be white.